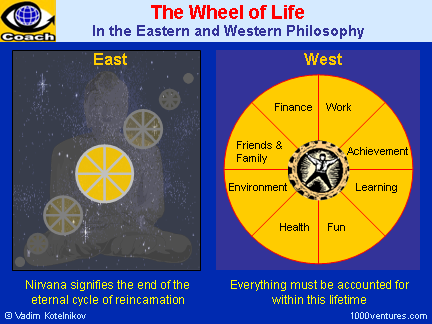 The Wheel of Life is a representation of the Buddhist teaching on the suffering and impermanence of cyclic existence. "In modern Western society, there seems to be a powerful cultural conditioning that is based on science. But in some instances, the basic premises and parameters set up by Western science can limit your ability to deal with certain realities. For instance, you have the constraints of the idea that everything can be explained within the framework of a single lifetime, and you combine this with the notion that everything can and must be explained and accounted for. But when you encounter phenomena that you cannot account for, then there's a kind of tension created; it's almost a feeling of agony. In Western psychology there may be a tendency to overemphasize the role of the unconscious in looking for the source of one's problems. This stems from some of the basic assumptions that Western psychology starts with: for instance, they do not accept the idea of imprints being carried over from a past life. And at the same time there is an assumption that everything must be accounted for within this lifetime. So, when you can't explain what is causing certain behaviors or problems, the tendency is to always attribute it to the unconscious. It's a bit like you've lost something and you decide that the object is in this room. And once you have decided this, then you've already fixed your parameters; you've precluded the possibility of its being outside the room or in another room.